At the heart of Norman Osborn's transformation into the Green Goblin is his "discovery" of the Green Goblin Formula. No single event has affected Norman more profoundly than his exposure to that formula, yet much mystery still surrounds its creation. How exactly does the serum work? Just how much of Norman's insanity can be attributed to the formula and how much to his own predispositions? I don't intend to answer these questions (since that will be the focus of a different section), but rather to provide a brief synopsis surrounding the Goblin Formula's inception. The story begins, as many Osborn stories do, with lies and deception. The true genius behind the Goblin Formula is Mendel Stromm, a business partner to Osborn and co-founder of their chemical company within Osborn Industries. 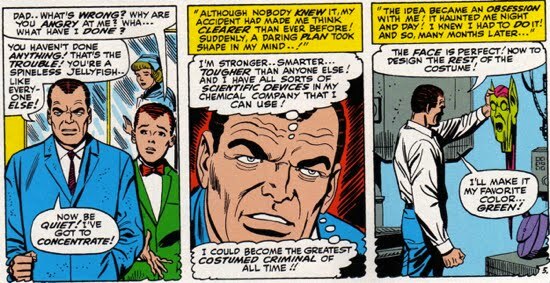 In fact, when Norman is recounting his past in Spider-Man: The Osborn Journal, he credits Stromm with creating the Goblin Formula, citing him as a brilliant chemist and roboticist. 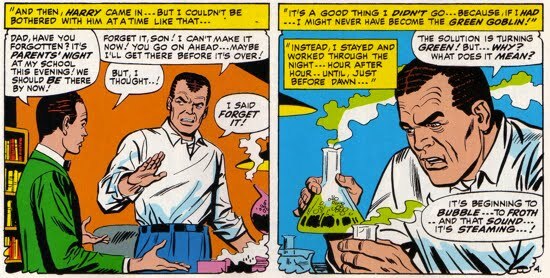 Norman also reveals in that story that Stromm actually tested a version of the formula on himself before he died in Amazing Spider-Man #37. This inevitably leads to Norman being able to revive Stromm from the "suspended animation" state that he was in after seemingly dying from a heart attack. Furthermore, in Amazing Spider-Man #40, Norman tells Peter how he eventually came into possession of the Green Goblin Formula. When Stromm borrowed money from their mutual account, Norman had him arrested for embezzlement. Stromm claims to have only borrowed the money and that he had no intention of stealing it. Osborn turns Stromm over to the police anyway, leaving Norman the sole owner of their company, while Stromm swears revenge upon Osborn. 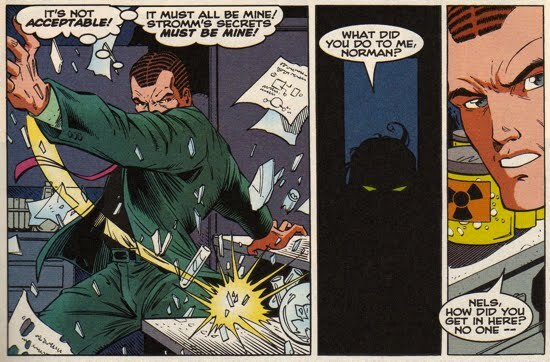 Additionally, in the retcon story Peter Parker Spider-Man -1, which takes place after Stromm has been arrested, it was revealed that Norman was experimenting on his own employee. That employee, Nels Van Adder, volunteered to work with Osborn prior to the creation of a stabilizing reagent for the formula. The results were disastrous, largely due to the fact that Osborn could not decipher Stromm's notes. 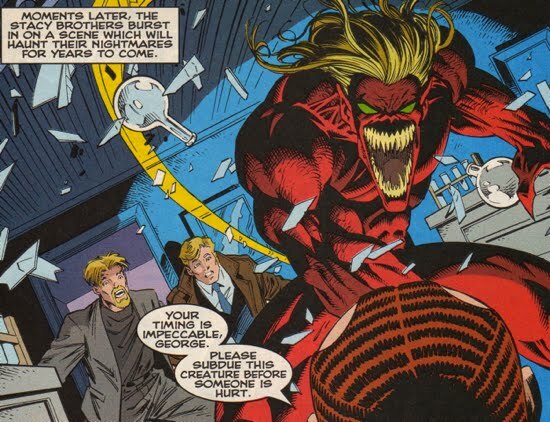 Van Adder was transformed into a red, demon-like monster dubbed the Proto-Goblin. This monster went on an uncontrollable murder spree, which eventually caught the attention of George and Arthur Stacy. It was around this time that Arthur Stacy had been hired to be the head of security for Osborn Industries, whilst George was police captain. Arthur quickly grew suspicious of his employer and began searching through Osborn's private files. 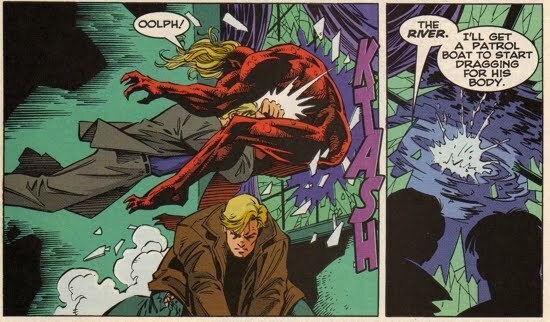 This act gets Arthur fired and nearly murdered by Osborn's thugs. 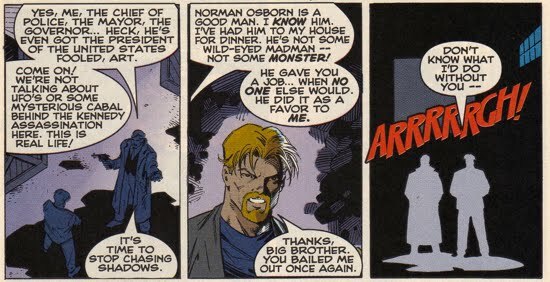 Arthur's brother had a quite a different view about Norman Osborn, in other words, Norman had George fooled. The two brothers, both investigating an Osborn Industries plant, are distracted by the monster's screams. 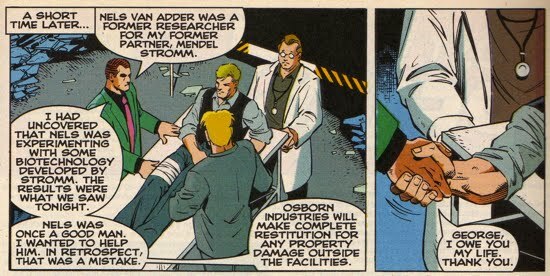 Van Adder was attempting to kill Osborn at Stromm's private laboratory, but Norman is saved by Arthur and George Stacy. The brothers work together and subdue the red Goblin. After launching him into a nearby river, the monster retreats, never to return. Osborn, of course, takes no blame from the whole fiasco. He tells the Stacy brothers that Nels Van Adder was a former employee who worked for another former empolyee, Mendel Stromm. Osborn goes on to blame for Stromm and Van Adder for the experimental biotechnology that created the Proto-Goblin. The private laboratory gets pummeled in the process but after the dust settles, Norman finds more of Stromm's notes hidden within the structure of his old desk. He is convinced that this is the remaining information he needs to re-create Stromm's work. This brings us back to Amazing Spider-Man #40 as Norman is recounting his tale of the Formula's creation to a restrained Peter Parker. Stromm's hidden notes that Osborn had found contained (at least according to Osborn) 'new, strange-looking formulas'. Norman's response was to 'cash in on them'. So Norman's initial intent was not to make a strength enhancing formula to use on himself, rather a formula that he could sell for profit to become (more) wealthy. 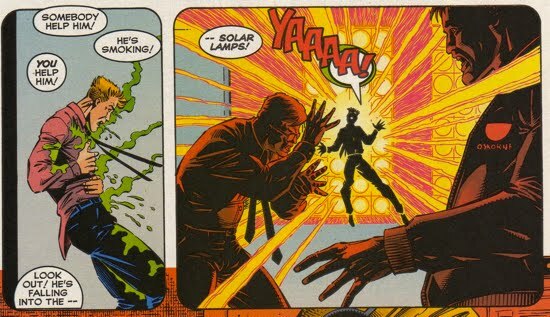 However, when Osborn attempts to duplicate Stromm's formula, it turns green and explodes in his face, which eventually lands him in the hospital. He recovers from his injuries after weeks in the hospital and soon realizes that the explosion has greatly increased his intelligence and strength. Norman's newfound powers are now a means to an end, and will allow him to achieve his goal of restoring the family name by attaining wealth and thus power. 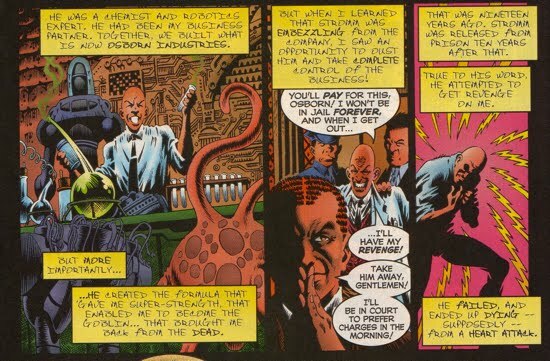 For the record, Osborn was already wealthy and powerful at this point in his life (owner of a chemical company, etc), the Goblin Formula enabled him to have more power and more wealth. Norman also realized that his new "capabilities" could aid him in criminal endeavors, so he set his sights on uniting the underworld of thugs and gangsters under his control. Soon after, he creates his Green Goblin identity (he chooses green because it is both his favorite color and the color of a demon that haunted him as a child) to strike fear into his enemies and begins his criminal career. 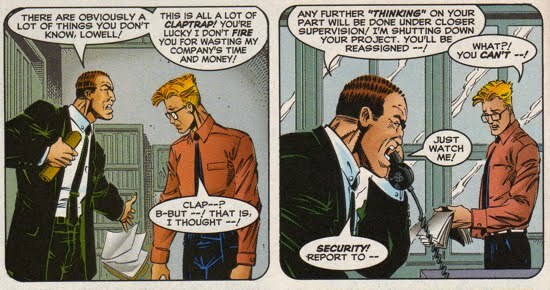 While Osborn is focusing his efforts to unite the criminal underworld, he is distracted by one of his own employees. 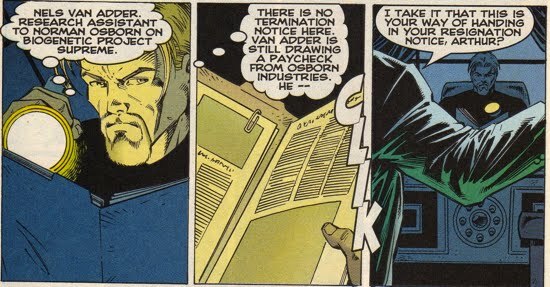 Van Adder wasn't the only Osborn employee to come in contact with a variant of the Goblin Formula. In fact, another incident took place just before the events of Amazing Spider-Man #21 and was featured in both the Untold Tales of Spider-Man '97 Annual and the Amazing Spider-Man '97 Annual. A research scientist at Osborn Chemical Company named David Patrick Lowell was working a photogenesis project when his life changed forever. His research involved the synthesis of a chemical compound to be used as a type of 'super fertilizer' that enhanced solar absorption of plants increasing their growth capabilities. But when another Osborn employee, Dr. Winkler, receives a promotion in front of Lowell, Lowell becomes irate. Lowell then confronts Osborn, showing him the progress he's made on the photogenesis project and demands that Osborn promote him as well. But Norman recognizes the chemical structure of Lowell's photogenesis compound and instantly realizes the similarities to the Goblin Formula that he had previously been exposed to. Norman then immediately shuts down Lowell's research and demands that he not pursue this any further in an attempt to block anyone from following (or uncovering) Norman's transition to the Green Goblin. Osborn then orders Donald Menken to dispose of all Lowell's chemicals and shred all of his notes. 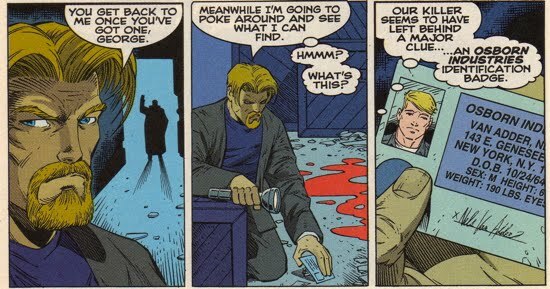 Lowell walks in on his work being destroyed and he grabs some of his photogenesis solutions from one of Osborn's lackeys. A struggle follows, and Lowell accidentally swallows some of the formula and falls back on to a group of solar lamps. Lowell's collision with the lamps leads to a large explosion and ultimately Lowell becoming the villain Sundown. Lowell, with his new found powers, goes on a destructive spree but is eventually thwarted by a veritable 'who's who' list of Marvel super heros. Lowell is then placed in jail at the conclusion of Untold Tales of Spider-Man '97 Annual. Lowell eventually returns to the Spiderverse in the Amazing Spider-Man '97 Annual. When Lowell is released from prison, he is approached by Donald Menken who offers him aid in getting back on his feet. Lowell refuses Menken's aid and is later blackmailed by Lucky Lobo as an attempt to get Lowell to work for him as well. With the aid of Spider-Man, Lowell is able to expose Lobo to the authorities. Spider-Man asks Lowell to consider using his powers for good as a super hero, but Lowell declines and disappears off into oblivion. Neither Lowell nor Sundown have been seen since. As in interesting side note, around the time the Proto-Goblin emerged, Norman Osborn met Peter Parker for the first time. 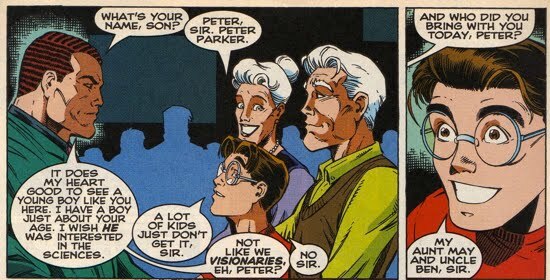 Peter was attending a science and technology exposition that was sponsored by Norman Osborn. Norman also met Peter's Uncle Ben and Aunt May. Despite the fact that the Official Handbook of the Marvel Universe A to Z , Vol. 8 (2009) (which contains the Norman Osborn entry) discredits the following story from Spectacular Spider-Man Annual #14, it's certainly worth including in this section. After Peter accidentally stumbled into one of Harry's posthumous traps, Harry confessed a new detail surrounding Norman's initial exposure to the Goblin Formula. Harry claimed to have broken into his father's lab and tampered/mixed the chemicals therein. Then of course, the infamous event which created the original Green Goblin occurred...the explosion! Harry is then shown pulling his father from the rubble. Harry's claim is that his tinkering in his father's lab is what led to the accident. The Official Handbook of the Marvel Universe A to Z , Vol. 8 (2009) dismisses Harry's testimony of these events because of his "mental state" at the time of the recording. The problem with that logic is that Harry's testimony is considered valid for other aspects of that story; namely Norman's abusive childhood. Moreover, Spidey seems to take Harry's confession at face value, he even tells Mary Jane once he gets home. So Peter wasn't overwhelmingly skeptical about Harry's confession despite Harry's opening remark that the memories in his digital recording may not be 'accurate' but they are 'true'. The Handbook also states that other attempts at replicating the Goblin Formula also ended in explosions (e.g. Lefty Donovan). Thus it discredits the notion that Harry's tampering created a unique event. That's a fair point, but the reality is that Norman's lab certainly contained numerous chemicals. Its entirely possible that Harry could have mixed different chemicals, ones not used by Norman to create the formula. Then once the explosion occurs Harry thinks that what he did caused the accident, a classic guilt complex. The psychology of this confession suggests Harry harbors guilt for aspects of his father's life. It's possible Norman tormented Harry so much about the death of his mother (or other things) that Harry genuinely felt responsible for his dad's pain...and thus his mistakes. Perhaps that's the way the authors want us to interpret this revelation. Still, its entirely possible that Harry did enter his dad's lab and mixed chemicals regardless of whether or not his actions directly led to the explosion. There's not enough evidence either way to rule out Harry's culpability entirely. The main piece of evidence that suggests Harry didn't create the formula comes from Norman's recollection of the explosion in Amazing Spider-Man #40. Norman claims to have worked "through the night...hour after hour" before he created the formula that exploded on to him. Clearly whatever happened to Norman was do his own attempts at chemistry. But should we really trust Norman's memory at that point? Certainly Norman's "mental state" at the time of Amazing Spider-Man #40 was questionable at best. Still, did Harry mess something up earlier in the evening that led to Norman's mishap? The interesting part of this discussion is that Norman certainly spent large amounts of time in his lab whilst ignoring his son. The notion that Harry would want to get in there and ruin something is so fitting that its hard to say, there's no way Harry inadvertently helped to create the Goblin Formula. 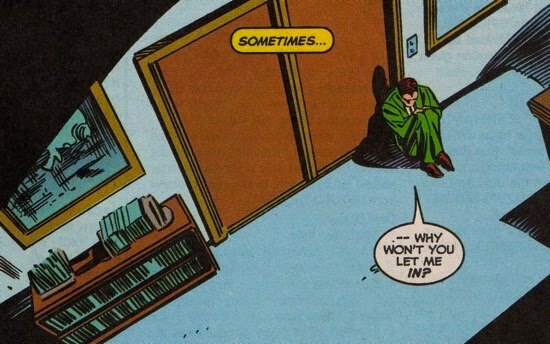 Look at the panel to the right from Untold Tales of Spider-Man #8, how could Harry not view the other side of that door as something worth destroying? 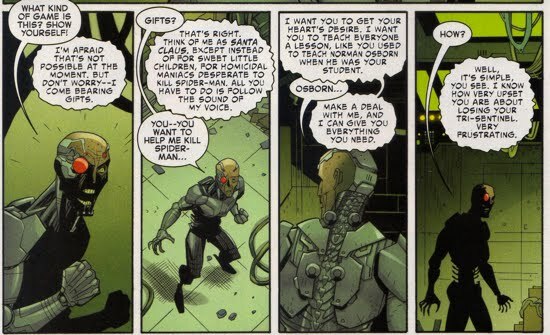 Another layer of complexity was added to the Stromm/Osborn relationship in Amazing Spider-Man #805 (aka Vol. 6 #4). In that story, a mysterious benefactor that plans to work with Mendel states that Norman was once Mendel's student. This is the first time that fact has been brought to light and it suggests that Professor Stromm was a faculty member at Empire State University.